ServiceMaster Professional Building Maintenance is a janitorial company with a patented cleaning system and product line created by ServiceMaster Clean. They are also the first Green Seal certified cleaning company in Nebraska. This means their Capture and Removal ™ green cleaning system and GreenFor ® product line is certified by a third party as good for the environment. They provide daily or three day a week janitorial services, monthly, quarterly or semi-annual carpet or hard surface floor cleaning and minimal maintenance services for businesses. They are also Ceiling Pro™ of Lincoln, a ceiling cleaning company and we have a patented system and product line for ceiling cleaning. Who are the owners/important executives? – Jon and Angela Paolini (owners), Scott Hoff (Director of Operations), Will Vaughn (Director of Night Operations), Fred Placzek and Bryce Roemer (Assistant Managers of Night Operations) and Lance Bain (Daytime Supervisor). What do you like about doing business in Lincoln? – I think Lincoln is a business and/or entrepreneur-friendly city. Between the organizations to help you begin a business to the banking systems here and government watchdog groups, businesses are protected, informed and supported for their success. What kind of community organizations/groups are you involved with? – Non-profits. I am a board member of both WasteCap NE and Willard Community Center. As a business we are involved in BETA, LIBA and IFMA. Do you have a business philosophy or mission statement? – To be the premier cleaning company in Lincoln by providing extraordinary service, conducting business honestly, providing opportunities for employees, and growing and remaining profitable. What changes have you seen in the industry and your company in the past few years? – Honestly, the industry remains the same, people like to pay little for their cleaning service but after doing so realize they cannot pay a cheap price for extraordinary service. Longevity and consistency or reputation have always been and probably will be the key to being successful in this industry as well as in our company. What do you see happening with the business in the next five years? – Growth in our people both as people and as numbers and in our business partnerships both profitable and charitable. What is one of the biggest challenges that your company has faced? – The tendencies of the industry as mentioned before. Longevity and consistency is a key to success as well as a challenge both in our industry and company. What has been your most important achievement as a business? – The growth even through recession and transition of ownership as well as our GS-42 certification through Green Seal as it was a rigorous process to obtain and demands yearly audits. What was the biggest turning point in your business? – The hiring of our current General Manager and now owner Jon Paolini hands down! What is one goal for your business that you have yet to accomplish? – Hire a new General Manager so Jon can wear only one hat and take a much needed break from the cleaning industry. He’s been in this business for almost 20 years. Grow Ceiling Pro™ of Lincoln to meet restaurants and/or businesses’ needs in areas 6 ft and above them! Is there anything else you’d like to add? – We are grateful for the partnership and support that franchise owners of a well-known and respected company like ServiceMaster Clean can afford. We partner and work quite well for instance, with the building services ServiceMaster franchise in Omaha or the Disaster Restoration services franchise “ServiceMaster of Lancaster County” here in Lincoln. In fact, we are in the process of introducing them to all of our customers. They’re family, not competition, and it’s great to be a part of a business relationship like that. 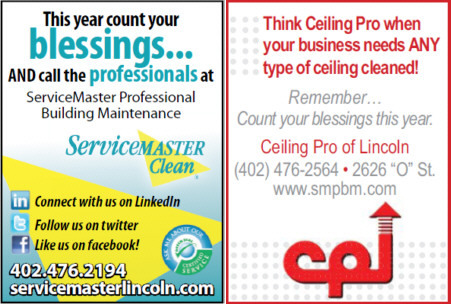 For more information ServiceMaster Professional Building Maintenance of Lincoln, NE visit http://ServiceMasterLincoln.com or call 402-476-2194 for more information about Ceiling Pro™ of Lincoln visit www.smpbm.com, or call 402-476-2194.